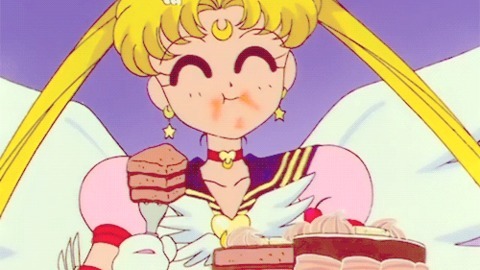 If you’ve made it this far into reading/watching Sailor Moon and undoubtedly countless other anime, I’m going to assume that you’re probably familiar with the fact that Japanese uses multiple writing systems.1 While hiragana and katakana are phonetic and (usually…) have a one-to-one correspondence between a character and a sound,2 each kanji has a unique meaning and can (generally…) be pronounced multiple ways. We’ve seen this unique aspect of kanji abused often in the Sailor Soldiers’ names, for example. But just in case that wasn’t confusing enough, Japanese media often likes to “kick it up a notch” and make up entirely arbitrary readings for kanji, which allows the author to choose an exotic-sounding name while also utilizing the meaning of the kanji to tip the reader off as to what it means. It’s a lot like having your cake and eating it too, basically. This use of kanji for its meaning, irrespective of reading, is known as ateji (当て字; lit. “assigned characters”),3 and is very common in manga.4 If you’ve ever seen me get into grumpy-old-man arguments about how manga is an awful way to try to learn Japanese, this is one reason why. So with that out of the way, let’s get back to the subject at hand! 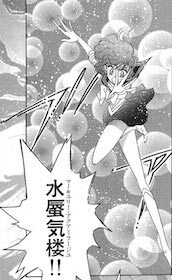 Though Ms. Takeuchi did do this on occasion throughout the entire run of Sailor Moon, there was a sudden change in the Infinity arc where we suddenly see a lot of attack names get the full-kanji treatment. 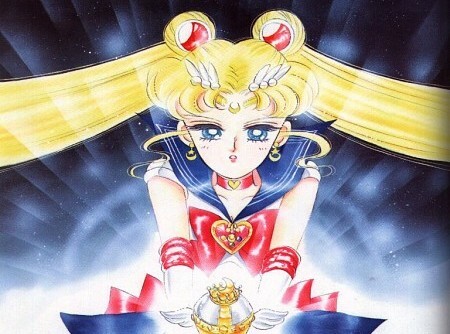 A possible reason for this change was due to Sailor Moon‘s rise in popularity in China. According to the fab¥n book, Chinese translators weren’t always familiar with the tokusatsu/Super Sentai7 style of fighting, which typically involves the characters calling out their attacks. This led to some of the Chinese translations suffering from awkward dialogue, since the Sailor Soldiers’s special attacks were simply translated literally, as if they were normal speech. This problem is even further compounded when you consider that Ms. Takeuchi and the anime usually used English words for the special attacks. This made it an even bigger burden on the Japanese to Chinese translator, as they needed to be familiar with the English word as well. So, the story goes, Ms. Takeuchi started using kanji for many of these attack names to give the Chinese translators (and fans!) a clearer understanding of what she intended for this attack to mean. And, in cases where the Chinese and Japanese meanings for given kanji/hanzi compounds are the same, the Chinese translators could use them as-is. This is by no means an “official” answer to the question, but I personally think it explains things pretty well. In fact, if you take a look through lists of Chinese translations for the relevant attacks, they often are the same or come pretty close to the kanji Ms. Takeuchi provided. Even if this isn’t the reason, the end result is certainly the same. The biggest hole in this theory, though, is why it’s mostly restricted to the Infinity arc, and why Jupiter and Venus’ attacks are missing. I can come up with plausible reasons why she stopped — namely that many of her readers were young and the insane kanji compounds aren’t young reader-friendly — but it’s still odd. Personally, I prefer having the attacks written out in kanji, because it gives you a sense of what Ms. Takeuchi was aiming for when she chose the attack names. But what do you think about all this? Just a stylistic choice for the Infinity arc, or was there some sort of deeper plan involved?? It’d be fun to hear other theories! ← Is the Sailor Starlights’ Kinmokusei a Planet or a Star? Submarine Violon Tide (深海提琴潮流) – “Tidal flow of the held zither in the deep ocean”; the literal Chinese name for the violin is “small held zither”, as contrasted with ancient East Asian zithers which sit on a table during performance. See the Wikipedia articles for “Guqin” and “Yamatogoto”. The only other case of a magical attack being written in Chinese characters outside Infinity arc was, if I recall correctly, 桂花百花繚亂 (Kinmoku Fusion Tempest). Personally, I would also love to have all of the attacks written like that just for that little bit of additional semantic nuance (and because I mostly abhor katakana words xP).